There’s something bitter-sweet about getting to the end of a great story. You get the pleasure of completion and of seeing what clever finale the creators had planned. But on the other hand, it’s over. No more of this. The end. Chew, one of my favourite comic series, just reached its finish. It was as ending that came out of everything that came before. It was powerful and striking and utterly bonkers. It was the perfect finale to this excellent series. I’m sad to see it go, but pleased that I got to see the end. 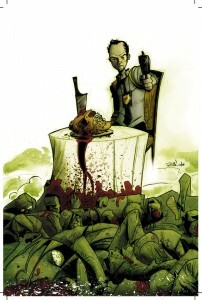 And the other sweet side of this is seeing what John Layman and Rob Guillory will do next. If you haven’t already, go read Chew. The whole story is there waiting for you now. And if you have a favourite ending – bitter, sweet, or a bit of both – let me know what story it was in the comments below. 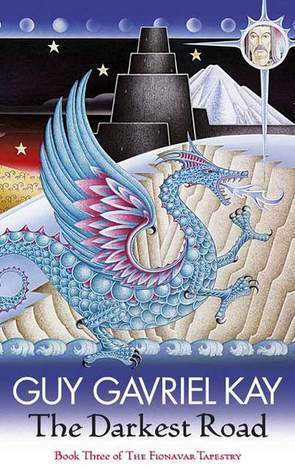 Guy Gavriel Kay is surely one of the greatest storytellers working in fantasy. The vividness of his prose and the power of his imagination is staggering. As I mentioned in earlier posts, the Fionavar Tapestry, one of his earlier works, was good but slightly less impressive in its first volume, becoming awesome in book two. But one of the marks of a great writer is how they end things, which brings us to The Darkest Road, the third and final Fionavar book. The mythical scope and texture of this series brought in ideas of fate from the very start, and much of The Darkest Road is occupied with paying off the destinies of its characters, exploring just how inevitable their fates are. In many ways it’s an exploration of freedom, and how free anyone can be in a world of active gods and complex relationships between different eras in time. This adds a sense of weight to events, as the characters struggle with inevitability. Kay strikes a fascinating balance between fulfilling and denying destiny, giving his characters logical fates. There is a sense of inevitability even when they break with destiny, as Prince Diarmuid does in one of the most dramatic moments of the book. Such is the necessity to foreshadow and build momentum behind events, that this character’s act of defiant free will feels as much a foregone conclusion as anything that has actually been pre-ordained. His destiny lies in his personality, not the weaving of the world, something that reinforced my love of Diarmuid as one of the best characters in the series. In a very real sense, this book was the most fitting way possible to end this series. But by fitting the tone of the series, and coming back to the issues raised in the first book, this left me feeling less satisfied than I hoped. This is a matter of personal taste. The grandiosely mythic seldom suits me, and I balk against the use of destiny to drive a story forward. I prefer to see characters making their own choices, not having them thrust upon them, and such was the sense of inevitability here, with even the moments of freedom permitted because of mythic forces, that I seldom felt like the characters were choosing, so much as they were following the path laid out for them. There’s also a sense of distance that comes with this mythic sort of writing. I didn’t feel drawn into the inner lives of the characters to the extent I have with Kay’s other books, and that, together with the inevitability, made me care less. Despite all those reservations, I enjoyed this book. It’s a reflection of just what a great writer Kay is that, even when he’s writing something that’s not to my tastes, he executes it so magnificently that I’m drawn along through every single page. I loved seeing the bond of friendship forged between Dave, Torc and Levon. It pained me when I thought terrible things were about to happen to Jennifer. I was left pondering questions of inevitability. Is this Kay’s best book? No. It’s not even the best book in this series, which was the magnificent The Wandering Fire. But is it worth reading? Oh yes. On an unrelated note, my science fiction collection Lies We Will Tell Ourselves is free on Kindle for one last day today – why not go grab a copy? I just finished reading Terry Prachett and Stephen Baxter’s The Long War, their sequel to The Long Earth. It’s fair to say that, while there’s a lot to enjoy in this book, I wound up as ambivalent about it as I was about its predecessor. This time though I think there was a clearer, more definite problem, and it’s one that interests me as a writer – it’s the problem of expectations. The Long War is set in the Long Earth, a series of millions of parallel Earths between which people travel. Over a decade has passed since the events of the first book, and humans are settling more and more into the parallel worlds. But there are conflicts brewing, as social and political change disrupt the status quo. As with The Long Earth, this is well written. It flows easily, the characters are likeable and interesting, and the world that’s being built is fascinating. I had the same problem with the narrative’s ambling nature as I had with the previous book, but that’s a matter of personal taste – I prefer my stories with a bit more focus, a bit more intensity to them. But this book had a problem its predecessor didn’t, and that’s in the expectations it set. Both the book’s title and its blurb implied a racheting up of the conflicts that were stirring in the previous book. There’s talk of how war is coming, and it’ll be unlike wars that have come before. It got me all ready for an exciting tale of action, in which the military implications of flitting between different worlds would be explored. That sounded exciting. And that’s not this book. It’s clear from the ending that there’s a reason why Pratchett and Baxter chose the name they did, and that the more low-key resolution is there to make a point. It’s an interesting point. It’s an optimistic one for human nature. It even says something about the nature of the Long Earth. But it wasn’t what I’d been led to expect. There’s wasn’t a big build-up of tension. There wasn’t a feeling that things could go violent at any minute. And there really wasn’t a war. In fact, if not for a single reference near the end, the book’s title would have seemed to be completely cheating. The thing is, I would have enjoyed this book a lot more if it hadn’t set those expectations. I’d have known from the first book what I was getting into. I’d have settled in for more well-written ramblings through a well developed world. But that Wasn’t what I was led to expect, and as I read I found myself increasingly disappointed as that promise wasn’t fulfilled. 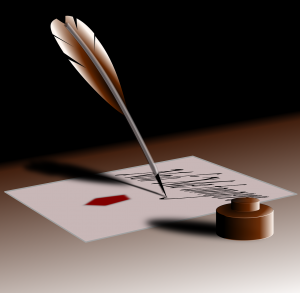 The writers on the Writing Excuses podcast often talk about the need to end a story by fulfilling the promises you make at the start, the things you’re implying it will be about. A book’s title and blurb are part of that start, and The Long War didn’t live up to its promises. As a writer, I’ve made a mental note not to make that mistake myself, to consider what my titles are telling the reader. Have you read The Long War? What did you think? And can you think of other examples where books don’t deliver on their promise, or deliver something completely different, for better or worse?